Season eight of That 70’s show proves to be the final from the shows eight year production. One of the more noticeable features from the show is the loss of actors Ashton Kutcher [Michael Kelso] and Topher Grace [Eric Foreman], who were arguably the cornerstones of the show. The writers attempted to fill the void frequently, enjoying little success. The shows series starts off as a recap, with Donna and Kitty comically recalling what had been happening for Eric who’d moved to Africa in the final series seven episode. The first episode also reveals the death of unpopular character Charlie, who had been brought in during the close of series seven as somewhat of a replica of Eric. It also marks the introduction of another new character, Hyde’s wife Sam who was the shows second unsuccessful attempt to introduce replacements for Eric and Kelso. Barring a strong first episode, the eighth season is a little disappointing. Having lost Eric for every episode apart from the finale, the role of his parents Kitty and Red Foreman is compromised with them unofficially adopting Hyde as a new son. They only have any significant storylines towards the end of the series, as with neighbour Bob Pinciotti. The show’s writers failed to cultivate anything massively refreshing throughout the course of the series, only adding smug new character Randy [Josh Meyers] who again failed to grow on audiences. 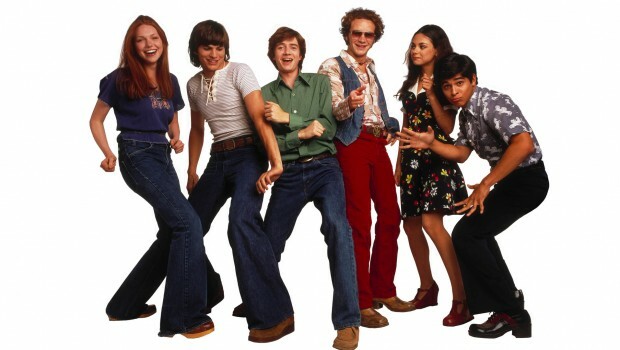 The biggest disappointment of That 70’s Show’s final series is the ending. The full cast return for the final episode, yet Kelso does nothing significant excluding his traditional falling from the water tower and joining in the circle to count down the new year. Eric is brought in towards the back end of the episode, yet the situation between him and Donna is left unresolved, frustrating fans who’ve watched them and their on again off again relationship for 200 episodes. It fails to really hit the climatic and emotional feel most programmes achieve during their finales, proving to be nothing more than an ordinary episode and deviating from the shows normally flawless season finales. As for additional features, 70’s Show keeps its usual style up with complete and utter disappointment. No deleted scenes remain a missing ingredient from the DVD, favouring the odd featurette that is a one minute interview with a cast member stretched out with video clips. Promos are available on every episode, but the features lack the touch which gives fans a real insight and personal look into the show. To say I’ve been a diehard fan of the last seven series, this was highly disappointing. After a great introduction episode, the show stagnates with every episode tarnishing the last eight years work and proving it couldn’t function without its two leading stars. It’s worth a buy to see how it all concludes, but otherwise I’d avoid.